Here at Toby Cottage we are pleased to announce our new Spring Set Menu. 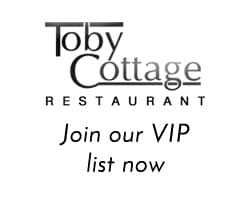 Treat yourself mid week at the Toby Cottage with our delicious set menu. This is available for either lunch or dinner, except Saturday evenings, with three courses available for just £19.50 per person, or a two course luncheon for just £15.00 per person. Call us now on 01483 224225 to book your table and experience our new menu made from only the finest, freshest seasonal produce available. For details and access to our exclusive offers please sign up to our newsletter below.